Florida International University (FIU) is seeking a business partner to develop and commercialize a conceptually new Class of Antimicrobial Polymers Containing Positively Charged Guanylurea Backbones for enhanced antimicrobial effects. Antimicrobial drug resistance has emerged rapidly and thwarted treatment options, leading to prolonged illness, disability, and death. Despite considerable efforts to develop new antimicrobial drugs, many bacterial infections remain difficult to treat due to acquired drug resistance. Compared to small molecular antibiotics designed to interrupt the bacterial intracellular biochemical processes, antimicrobial polymers disrupt the membrane integrity, offering a promising strategy to overcome drug resistance. Bacteria have little chance of developing resistance mechanism against the physical disruption, which often leads to cell death. FIU inventors have developed a new class of linear polymers containing positively charged guanylurea backbones. Compared with most antimicrobial polymers with positively charged side chains, the new polymer design introduces both positive charge and hydrophobicity into the flexible polymer backbones. 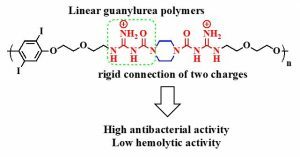 The initial structure−activity relationship studies demonstrate that poly-(guanylurea piperazine)s (PGU-Ps) exhibit excellent antimicrobial activity against different types of bacteria with high selectivity. The new design concept of using a positively charged guanylurea backbone will contribute to the development of future biocompatible, specific, and selective antimicrobial polymers.